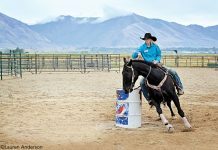 Understanding the responsibilities of horse ownership just became much easier thanks to a new DVD, HorseSmarts: Essential Advice for Today’s Horse Owner, from the Kentucky Horse Council (KHC) and produced by Marvo Entertainment Group. In an effort to meet the needs of new and potential horse owners, the Kentucky Horse Council collaborated with equine industry experts to produce a sixty minute film. The DVD contains 10 chapters including horse selection considerations, nutrition, hoof care, safety, tack, veterinary care, preventative healthcare, facilities, trailer loading and transportation, and all about the Kentucky Horse Council. Supplemental information and articles are included in PDF format on the DVD and can be viewed and printed after purchase. Some footage for the project was shot by Student Leadership Technology Program students from South Floyd High School and student interns. 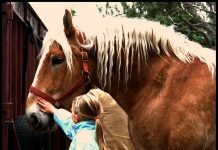 “Our goal in creating this DVD is to help all horses receive better care and to provide resources so that new horse owners have a safe and enjoyable horse ownership experience,” Millard continued. The video is now available for purchase from the Kentucky Horse Council. Negotiations are currently underway with both local and national retailers so that the video will be available throughout Kentucky and the country. “It’s a really good program for people who are thinking about buying a horse but you know, I [also] thought it was just good general information for anybody,” commented Kentucky Educational Television Director of Programming Craig Cornwell after the Lexington Premier. 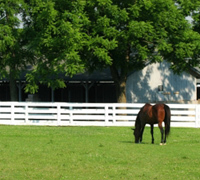 HorseSmarts is slated to air multiple times throughout the spring and summer on all 15 affiliates of Kentucky Educational Television beginning May 1, 2009. Filmed on location at horse farms and equine facilities throughout Kentucky, HorseSmarts features renowned jockey Chris McCarron as the host. Special presenters include: Bob Coleman, PhD PAS, Charles Anderson, PhD, Roberta Dwyer, DVM, Jennifer Newman, DVM, Mitch Taylor, CJF, and many more. The video received a 2009 Silver Communicator Award of Distinction by the International Academy of Visual Arts and the Communicator Awards. The Communicator Awards recognize creative excellence for communications professionals. For more information regarding the DVD or to order a copy visit www.kentuckyhorse.org/horsesmarts or contact the Kentucky Horse Council at 859-367-0509 or email info@kentuckyhorse.org. Hmmm. Not a bad idea; they just need to figure out a way to get it into circulation now, and convince possible horse owners to watch it. I like the idea, they just need to really get it out there.